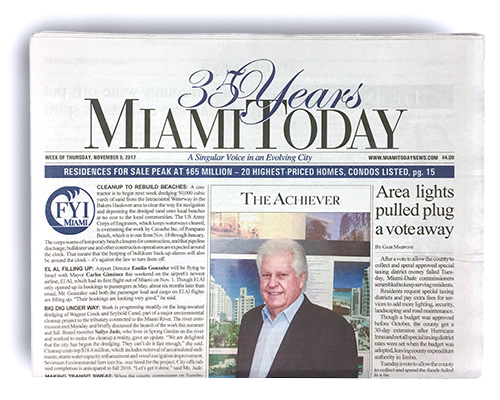 Receive Miami Today’s print edition each week by mail to your home or office. Place a Print Edition order online. e-Miami Today is an exact replica of the printed version. Read it on your iPad or Android tablet. Enjoy our online archive of the past 13 years of Miami Today issues or search within any of these issues. Print and email articles. Missed an article you wanted to read? Looking for information for research? Purchase this week’s paper $6 or any back issue for $7. We will send your chosen issue of the paper to your home or office address. Place a Single Issue order online. The Book of Leaders is Miami’s Hall of Fame. This special edition book features each year’s book profiles 52 Newsmakers and Achievers just as the reports appeared in Miami Today. These leaders share their passions and ambitions in their own words about shaping Greater Miami and are not available anywhere else. Purchase the Book of Leaders online. Was your company featured in an article or listing in Miami Today? Interested in re-publishing or posting an article you read? If so, Miami Today can provide you with the custom reproductions of Miami Today articles in an array of print or digital formats. If you are interested in placing Legal Advertising or a Public Notice, Miami Today is one of the official legal publications of Miami-Dade County and offers competitive rates for premium value.